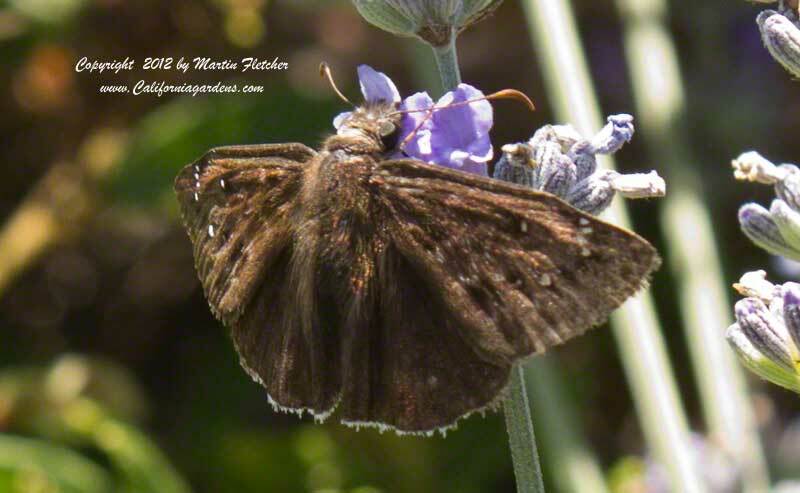 Mournful Duskywing butterflies are often feeding at plants in the mint or sage family including this blue lavendin, Lavandula intermedia provence. The caterpillars feed on a variety of oak leaves (see Quercus below). The Mournful Duskywing range is from Northern California south to Arizona and occaisionally Texas. Butterfly Bushes, Sage family plants, goldenrod family plants, and buckwheat family plants are regular nectar sources for the Mournful Duskywing. The following list are plants that we have found attract the Mournful Duskywing to our butterfly gardens. Mournful Duskywing Butterfly feeding on lavender blossoms. High resolution photos are part of our garden image collection.